Ahlers Designs has become a sought-after studio because we blend stunning fine art with business savvy to deliver your company’s unique message, but we don’t stop there. Private commissions are a wonderful way to honor a special person in your life and spread joy, and Gail Ahlers will get to know your tastes and unique artistic vision so she may bring it to life. These outdoor sculptures draw upon Gail Ahlers’ passion for green innovation, organically-inspired shapes, and metals. The abstract, minimalist design allows the sculptures to catch the eye while also accentuating a botanical setting. 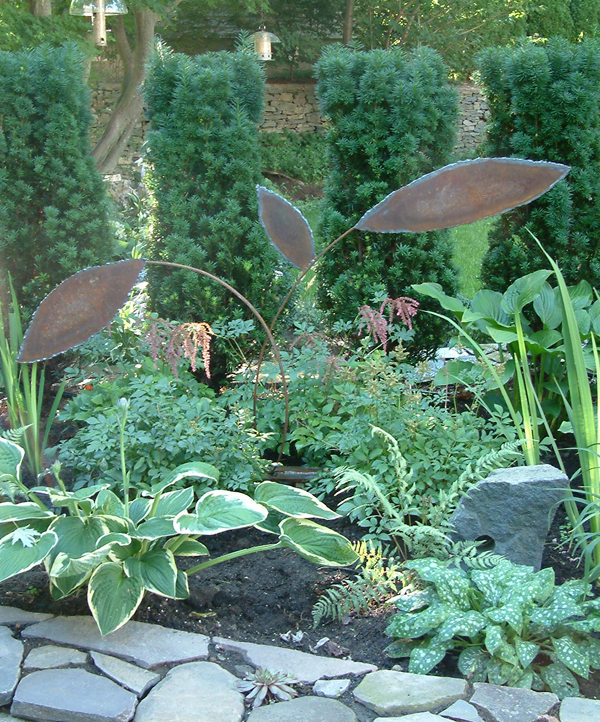 Gail cut the steel to build the base and branches, and designed elegantly oval-like leaves with a patina finish to shine at the top.